Watermelon Curry, something new to try out! 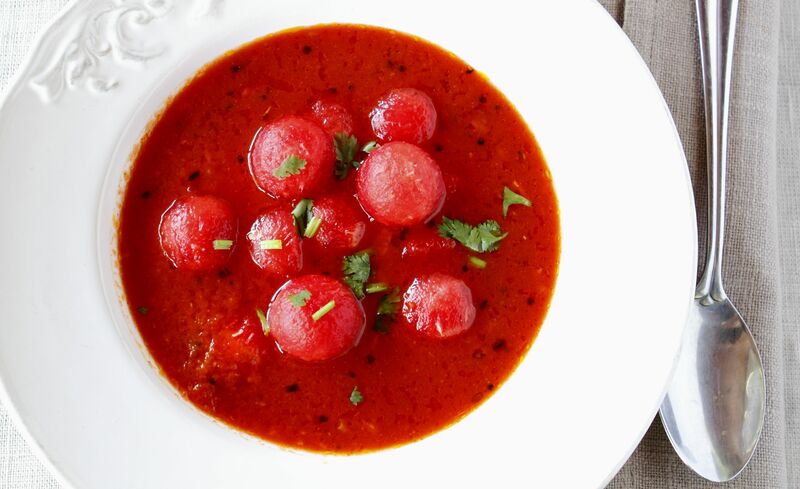 The words to describe this delightful watermelon curry would be: light, luscious, and no less an authentic Indian curry. Check out the recipe below. Using a melon ball scoop, scoop out as many melon balls as you can. Set aside. Remove the watermelon skin and place the remaining watermelon flesh in a blender. Grind the coriander seeds and add to the blender along with the garlic, turmeric and chilli. Blend until smooth. Fry the cumin seeds in a little oil until they splutter, then add in the blended watermelon mixture. Reduce heat and cook until it thickens. Season to taste with salt and sugar. Add the watermelon balls and cook for 1 minute. Turn off heat and season to taste with lemon juice.